The buzz of the Ryder Cup is still in the air even after almost a week. People are still talking about Tiger Wood's eagle on #12 and Rickie Fowler's brilliant comeback versus Francesco Molinari and that's from the losing side. Who can forgot the amazing putt by Graeme McDowell on #16 to go 2 up on Hunter Mahan and the subsequent gaffe of a shot by Hunter on the next hole for the point that Team Europe needed to win back the Cup. 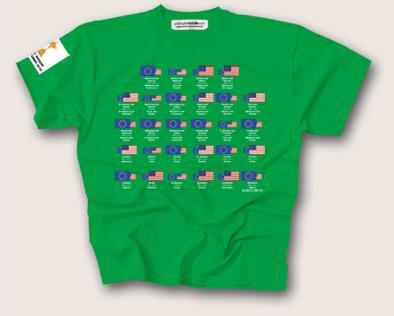 Well now you can purchase a Ryder Cup shirt that retells the tournament results from the historical 2010 Ryder Cup in Wales. A very ingenious t-shirt design that everything but the Cigar Guy. Check it out.